September has officially arrived which means Fall is just around the corner. Since, it's not quite sweater weather yet, the utility vest is the perfect transitional piece to usher us into the cooler months. Here are three ways to style this versatile closet staple. Amanda from Advice From A Twenty Something styles her vest with a plaid shirt, white pants, and ankle boots. As it gets cooler, just add a jacket and your ready for a scenic stroll among the Fall foliage. 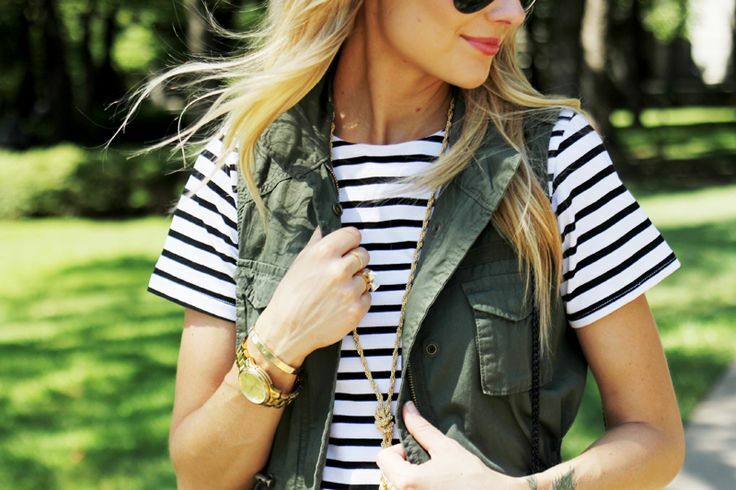 Caroline from Unfancy pairs her vest with a lightweight v-neck shirt and shorts. Combat the cooler weather by simply adding tights and a chunky sweater. Kat from With Love From Kat styles her utility vest with a classic striped t-shirt dress. She accessorizes with a neutral clutch and gold accessories. Her look is casual yet, polished. As the tempature drops add a scarf, sweater and tights. How would you style the utility vest? Let us know in the comments below! To purchase a vest similar to the ones above click here and here.